CHILDLINE is a 24-hour free toll free-help-line and outreach service for children in need of care and protection that links children to a long-term services. It is a project of the Ministry of Women and Child Development, Government of India. This service has been started in all the six blocks of Pakur district. Our organization served as a collaborative organization for this Child help line Service in Pakur district. 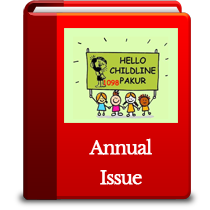 We are in the seventh year of serving the CHILDLINE service in Pakur District. Through out the year we have taken a total of 2000 + numbers of child cases of different category like missing children, child in need of medical treatment, child trafficking, child abuses etc. this year we have also activate the child help line toll free number 1098 in Pakur block of Pakur district at our Childline collaborative center at Pakur. Funding partner – Childline India Foundation, Mumbai. Operational areas – All the 6 (Six) Block of Pakur district in Jharkhand state. Considering the major challenges issues in implementation of CHILDLINE in Pakur district, and hard to reach geographical locations, the CHILDLINE rural model structure is functioning in our area. i.e CHILDLINE Nodal and Collaborative centre are in Pakur city, two Sub Centres are in Littipara Block, two Sub Centres are in Mahespur Block, one Sub Centre is in Amrapara Block and one Sub Centre is in Pakuriya Block.